A limited number of tickets remain for the final round of our March Madness Style Blind Tasting Tournament in search of the best iPA in Massachusetts. Click here for more details and for tickets. 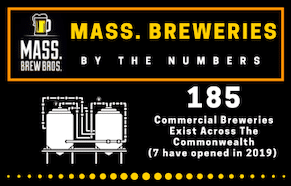 It’s been a slow start to what promises to be a big year for craft brewery openings in Massachusetts, but things look like they’re about to heat up as spring approaches. To date, seven new breweries have debuted: Channel Marker Brewing in Beverly, Black Rabbit Farm Wild Ales in Southwick, Redemption Rock Brewing in Worcester, Holyoke Craft Beer in Holyoke, contract brand Wandering Soul, Sena Farm Brewery in Worthington (they’ve started brewing but aren’t open to the public yet), Night Shift’s new Lovejoy location, and Vitamin Sea Brewing, who opened their taproom back in February. Several more appear on the cusp of opening, including Lost Shoe Brewing & Roasting in Marlborough, BearMoose Brewing in Everett, Granite Coast Brewing in Peabody, East Regiment Beer Co. in Salem, Agapé Brewing Community in Gloucester, Distraction Brewing in Roslindale, Fieldcrest Brewing in Wilbraham, and Leadfoot Brewing in Chicopee. Another, existing production brewery 6A Brewing, will debut a taproom in Sagamore. Behind them are dozens more, all hoping to produce beer before the end of 2019. Stay tuned. A few closures to report include Ware’s nano production brewery Blazing Bandit, which opened briefly at the end of 2018 but has since closed, a recent announcement from Lefty’s in Greenfield that they’ll be closing in midway through this month, and the removal of the brew houses at both Boston Beer Works locations, in essence rendering them restaurants because they will no longer brew on premises. The next quarterly update in scheduled for the end of June / beginning of July.